The Retezat Mountains are often regarded as the pearl of the Southern Carpathians. Their rugged landscape, soothed by numerous blue tarns, attracts many visitors each year. The area is covered by a broad net of well-signed hiking trails, but the number of mountain huts is rather little. Therefore most hikers choose to bring along their tents and complete camping gear, and base themselves at the designated alpine campsites. Those who prefer less nomadic conditions are left with very few options, as there is hardly any hut to be found in the alpine zone. The one that will be introduced now is the highest tourist hut of the entire range. This is the Cabana Genţiana, a charming, yet very basic hut, offering no "wellness treats", but a genuine mountain experience. The building was upgraded from a former hunting hut by the tourist association Montan Club Floarea Reginei Valea Jiului, which has been taking care of the facility since 1990. 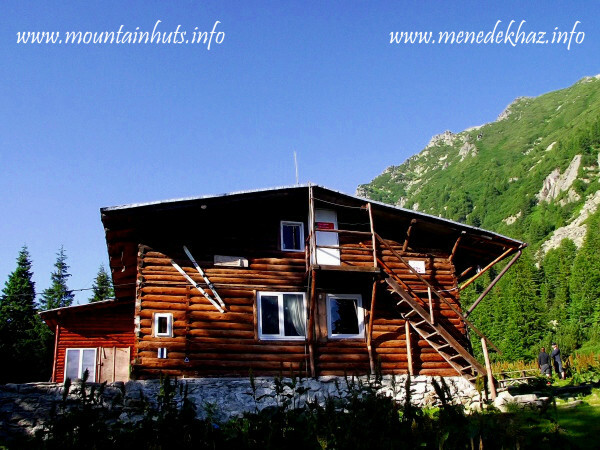 The Gentian Hut is situated in the most frequented northern valley (Pietrele) of the Retezat Mountains, right by the main trail that traverses the range from north to south. 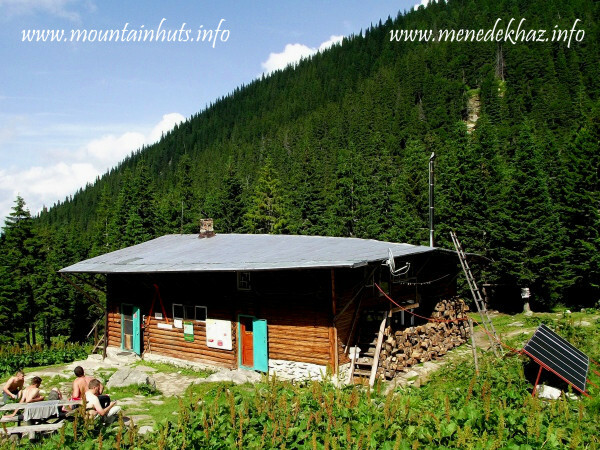 Its favorable location makes the hut especially appealing for the visitors who approach the Retezat Mountains from the Haţeg Basin. By car, one can reach only as far as Cârnic (tourist hut and a few pensions, roughly at 1000 m a.s.l. ), from where an additional 2-3 hours of hiking is ahead of us until we arrive to the Gentian Hut. The main trail, marked with blue stripe, leads through the Pietrele tourist complex (tourist hut with cottage houses, at 1480 m a.s.l.) with a small detour. If we would like to go straight to the Gentian Hut, we shall detach from the blue stripe before the complex and follow the blue triangle marks. The trail is very frequently signed (in every couple of meters) with reflective plates, so getting lost is very unlikely even at night (provided that we have headlamps, but that is obligatory in such circumstances). This might sound to be over-cautious, but it can really come handy if you arrive late and have to find your way in the dense pinewood forest of Retezat. Since the hut cannot be approached by motorized overland vehicles and nor is it equipped with any material transport cableway, the food and drink offer is very modest: guests can buy only chocolate, juices, soft drinks, beer and a specially seasoned "mountain tea". Nevertheless, a few years ago there was nothing except for the delicious tea, so the current selection can be regarded as an extended service. If you want more, that must be transported in your backpack (along with the stove that you would like to cook it with)... By the way, at certain times you will find a log depot by the trail (above the Pietrele complex) stocking firewood for the Gentian Hut (as we are in a national park, it has to be supplied from external sources). If you are in good shape and would like to volunteer, you can take a log or two up to the hut – the manager will reward your kindness with a free tea. Currently, two persons are in charge of managing the hut, exchanging each other every second week. They are very friendly but unfortunately do not speak other languages than Romanian, so advance booking your place on phone (which is a good idea) can turn out to be a challenging task. If you are lucky, some guests may be available to bridge the language barrier if they are on the spot when you are calling. Hopefully, the managers will sooner or later learn the basic English vocabulary. 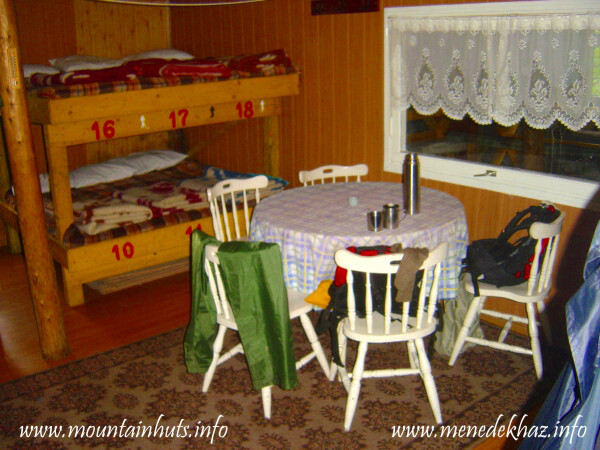 The Gentian Hut offers two kind of lodging: there is one dorm room at the basement (having place for 18 persons in bunk beds) and another one in the rather dark and airless attic (having 22 sleeping places on mattresses). The basement room can be heated by a tile stove. The places are given out based on the "first come, first served" policy (upon arrival, not the booking). Accommodation prices in 2014 are as follows (per person, per night): 30 RON in the basement, 25 RON in the attic. The basement includes a spacious dining room, where the guests can store their food in a cupboard with numbered boxes (matching the bed numbers). There is also a small room by the entrance for the manager. For dishwashing and drinking we can use the sink and the tap located in the small entrance hall, but for bathing we have to get outside and walk a little to reach the "open air bath", which consists of two wooden banks stretching across a side-stream of the Pietrele creek. Needless to say, the temperature of the water does not exceed a couple of degrees Celsius, even in the warmest summer months. The outhouse is also a short walk away from the hut, in the opposite direction. It has to be admitted that this facility can be... well, discouraging... and could benefit from some development. As for the other end of the technical spectrum: the interior lighting of the hut is served by solar photovoltaic panels, located just next to the main building. How about the hiking possibilities? Although the Gentian Hut is located within a valley, most of the popular sights and destinations of Retezat Mountains can be reached from here by one-day round trips (i.e. the tarns of the Bucura glacial cirque, Peleaga peak, Retezat peak etc.). Do prepare for strenuous hikes though, as the daily elevation gain/loss will most likely reach and easily exceed ± 1000 m. If you wish to explore the beauties of this range with less climbing, you will have to resort to camping at a higher location, for example by the Bucura Lake (where a very basic wooden refuge can also be found, but it is used for accommodating the mountain rescue team in the summer season). The Gentian Hut is open around the year, but the busiest time is during the summer months (from June to August). In the cold season, the managers’ willingness for heating may vary, depending on how much wood was stocked up during the summer months. Do not expect tropical temperatures, but you will surely feel much better inside than out. Otherwise the hut is in good hands, they are continuously upgrading it and the year-by-year development can be noticed. Summary: Cabana Genţiana is the highest and centermost lying mountain hut of Retezat Mountains, open throughout the year. It does not offer full comfort, but its services suffice the needs of true mountain lovers, either stopping by for a night or staying here for more days. I can recommend it for backpackers who can stand the semi-nomadic circumstances (own food, limited sanitary services). If you are planning to sleep here, try to make a reservation ahead by phone despite the language barrier (in the morning or in the evening there is a chance that someone will be around who can help with the translation).